Traumatic injuries related to athletic activities in general are closed traumas and usually affect the bony parts, ribs, clavicles, and less frequently the sternum, spine, and scapula, and consequently are of less seriousness for the athlete. These individuals may have isolated or simultaneously other major risk factors such as pneumothorax, hemothorax, and pulmonary or myocardial contusion or situations involving life-threatening conditions, including tension pneumothorax, massive hemothorax, cardiac tamponade, or commotio cordis. Therefore, a careful and systematic initial evaluation by the professional at the event site is necessary for stratification of the potential severities and initial measures to stabilize the airway, ventilation, circulatory, and hemodynamic status. 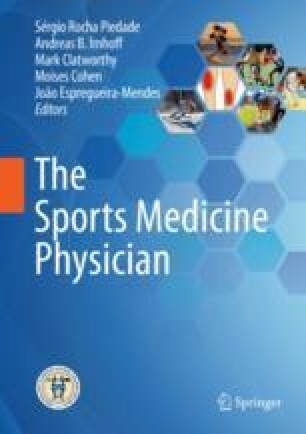 After adequate initial stabilization, the athlete should be referred as soon as possible to a trauma referral hospital for further detailed evaluation and definitive therapeutic procedures. This chapter aims to present an overview of the individualized main diagnoses in chest trauma and to allow the reader to acquire the most relevant information for the initial care and definitive treatment of these patients.